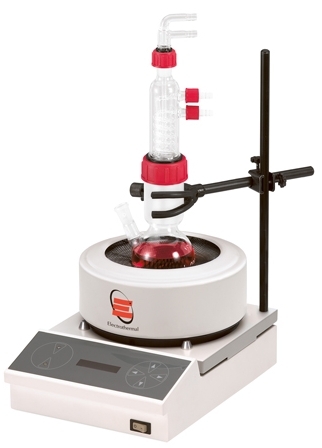 Digi-Mantles enable a flask of 250ml, 500ml or 1000ml capacity to be heated and stirred through precise electronic control. They have a modular design which allows heating cartridges of different sizes to be interchanged using the same OMCA digital controller as a base, which makes the Digi-Mantles a very cost-effective and space-saving option. The heater cartridge ensures that the temperature is uniformly distributed across the flask. Even with the element temperature at 450°C, the outside of the heater cartridge remains "cool-tothe- touch" due to a continuous air flow through ventilation slots beneath and around the rim of the case. Used to control both temperature and stirring speed independently, the OMCA digital controller has a revolutionary CTC (Capacitance Touch Control) panel, which is both easy to read and use, and you can quickly set the required temperature and stir speed using the up/down arrows. The control panel has separate indicator lights for the power, heater and stirrer functions, along with a 2 x 16 digit display indicating the actual temperature from ambient to 450°C (max element temperature). Stirring speeds from 100 to 2000rpm are obtained by lightly touching the stirrer speed keys. Heating is controlled by a modern state of the art microprocessor, which displays the heat setting as a percentage of the total power. An optional PT100 temperature probe may be used to gauge the temperature of the flask contents more accurately; the temperature probe's heating is controlled via the temperature feedback circuit and the actual temperature is displayed. The temperature probe operates up to 250°C.